Keyboard Lessons - ABE S.O.S. 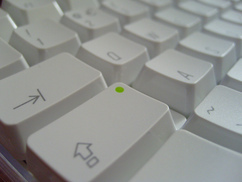 The objective of this lesson is to demonstrate typing skill speed and accuracy. If you have access to Teknimedia, complete Computer Skills modules 1-18. If you cannot access Teknimedia, complete the Mavis Beacon Knowledge Tools lessons to increase your speed and accuracy. If you can not access any of the above, use this outside free resource: Learn To Type. Stay focused on the lesson! When you complete the lessons, don't forget to close those windows and return here! Reminder: Close a window by selecting the X on the top corner of the window you wish to close. Show the Certificate of Accomplishment or evidence to your instructor. Save the Certificate of Accomplishment or evidence digitally and send it to your instructor. When Technology does NOT work!